2 sandwich placement. 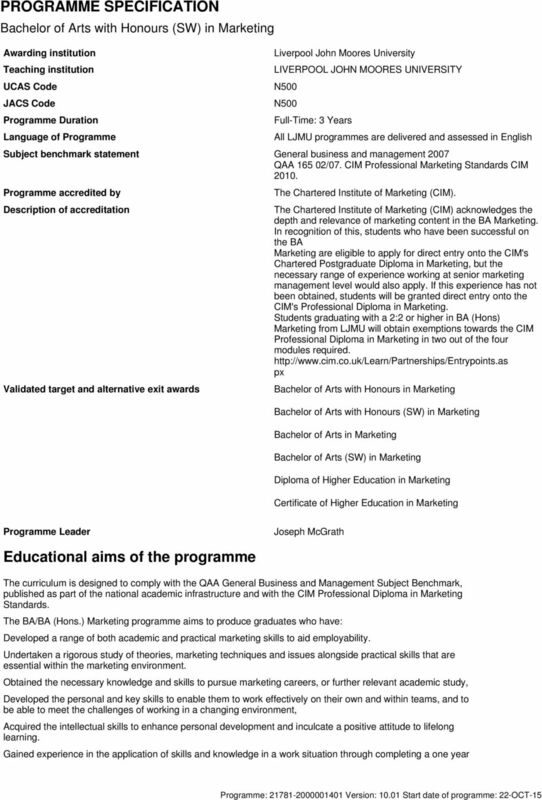 Demonstrated sufficient standards of marketing knowledge and therefore receive direct entry to at least the Professional Diploma in Marketing level of the CIM qualifications. To encourage students to fully engage with the World of Work programme, including the World of Work Skills Certificate and, as a first step towards this, to complete Bronze (Self Awareness) Statement. Alternative Exit/ Interim Award Learning Outcomes - Certificate of Higher Education Use a range of appropriate business software in a marketing context. Describe the structure, functions, processes and management of business organisations. Apply basic quantitative techniques to marketing problems. Understand the issues of marketing in the wider business context. Understand the intergrated marketing communications tools. Understand the foundations of marketing. Alternative Exit/ Interim Award Learning Outcomes - Diploma of Higher Education Analyse the structure, functions, processes and management of business organisations. 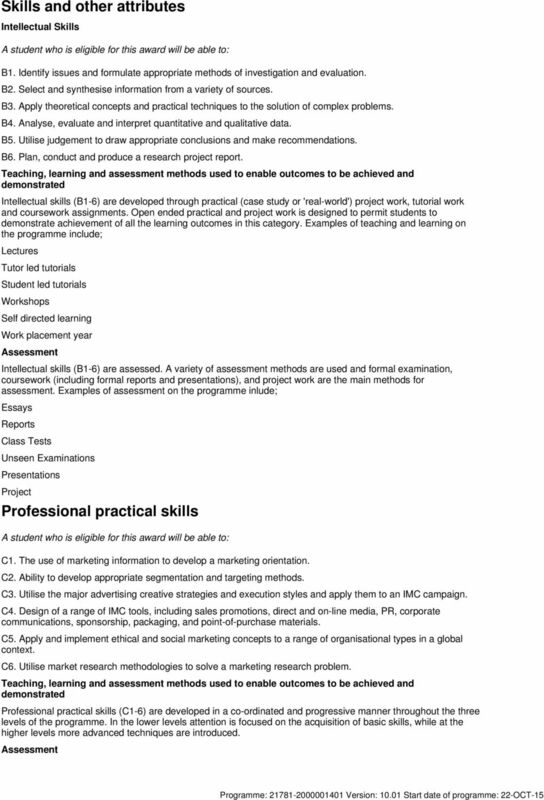 Develop a research proposal appropriate for a level 5 marketing research project. Analyse the principles of marketing and the role it plays within a wider business context. Identify the internal and external influences on consumer behaviour. Critically analyse the effects of corporate social responsibility on the marketing orientated firm. Analyse the importance of relationship marketing for successful strategic growth. 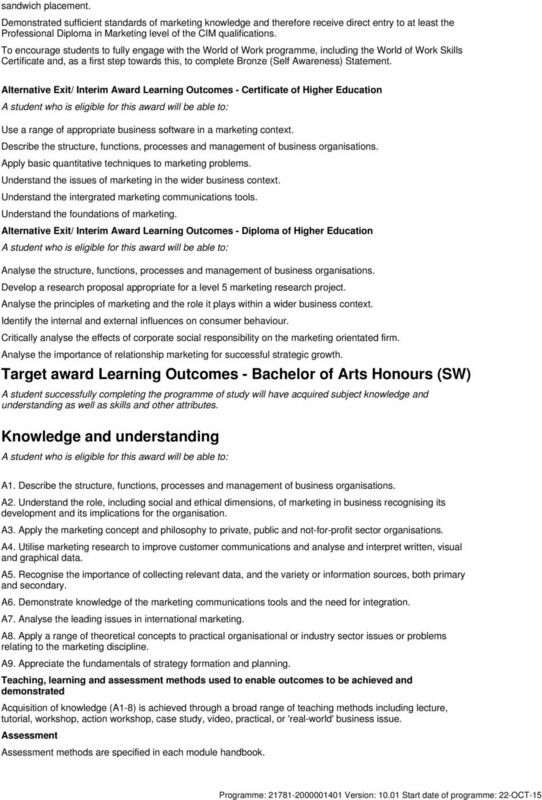 Target award Learning Outcomes - Bachelor of Arts Honours (SW) A student successfully completing the programme of study will have acquired subject knowledge and understanding as well as skills and other attributes. Knowledge and understanding A1. Describe the structure, functions, processes and management of business organisations. A2. Understand the role, including social and ethical dimensions, of marketing in business recognising its development and its implications for the organisation. A3. Apply the marketing concept and philosophy to private, public and not-for-profit sector organisations. A4. Utilise marketing research to improve customer communications and analyse and interpret written, visual and graphical data. A5. Recognise the importance of collecting relevant data, and the variety or information sources, both primary and secondary. A6. Demonstrate knowledge of the marketing communications tools and the need for integration. A7. Analyse the leading issues in international marketing. A8. Apply a range of theoretical concepts to practical organisational or industry sector issues or problems relating to the marketing discipline. A9. Appreciate the fundamentals of strategy formation and planning. Acquisition of knowledge (A1-8) is achieved through a broad range of teaching methods including lecture, tutorial, workshop, action workshop, case study, video, practical, or 'real-world' business issue. 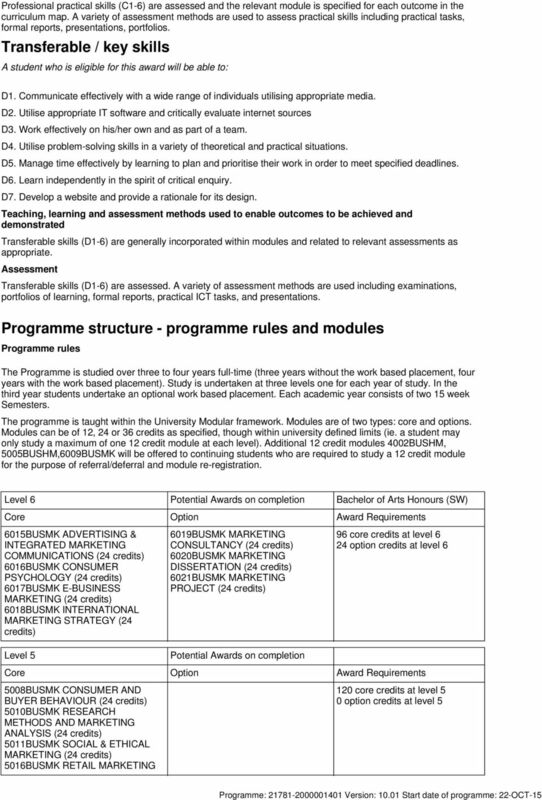 methods are specified in each module handbook. 3 Skills and other attributes Intellectual Skills B1. Identify issues and formulate appropriate methods of investigation and evaluation. B2. Select and synthesise information from a variety of sources. B3. Apply theoretical concepts and practical techniques to the solution of complex problems. B4. Analyse, evaluate and interpret quantitative and qualitative data. B5. Utilise judgement to draw appropriate conclusions and make recommendations. B6. Plan, conduct and produce a research project report. Intellectual skills (B1-6) are developed through practical (case study or 'real-world') project work, tutorial work and coursework assignments. Open ended practical and project work is designed to permit students to demonstrate achievement of all the learning outcomes in this category. Examples of teaching and learning on the programme include; Lectures Tutor led tutorials Student led tutorials Workshops Self directed learning Work placement year Intellectual skills (B1-6) are assessed. A variety of assessment methods are used and formal examination, coursework (including formal reports and presentations), and project work are the main methods for assessment. Examples of assessment on the programme inlude; Essays Reports Class Tests Unseen Examinations Presentations Project Professional practical skills C1. The use of marketing information to develop a marketing orientation. C2. Ability to develop appropriate segmentation and targeting methods. C3. Utilise the major advertising creative strategies and execution styles and apply them to an IMC campaign. C4. Design of a range of IMC tools, including sales promotions, direct and on-line media, PR, corporate communications, sponsorship, packaging, and point-of-purchase materials. C5. Apply and implement ethical and social marketing concepts to a range of organisational types in a global context. C6. Utilise market research methodologies to solve a marketing research problem. Professional practical skills (C1-6) are developed in a co-ordinated and progressive manner throughout the three levels of the programme. In the lower levels attention is focused on the acquisition of basic skills, while at the higher levels more advanced techniques are introduced. 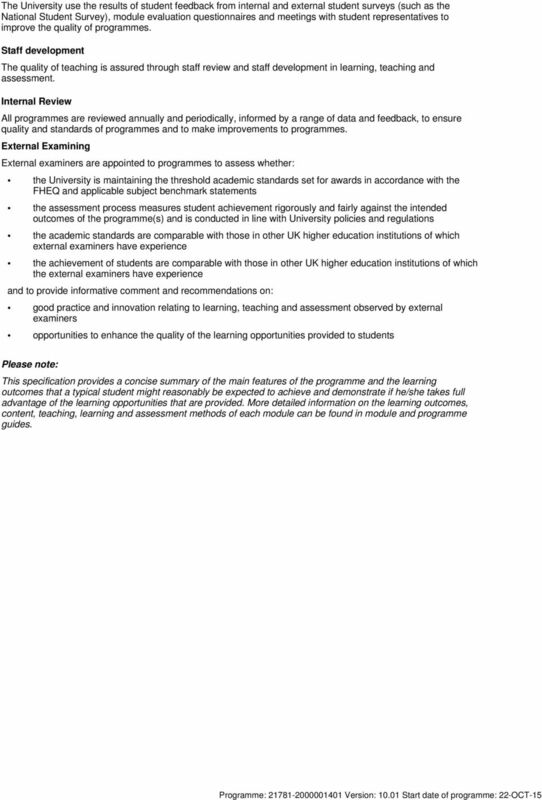 7 The University use the results of student feedback from internal and external student surveys (such as the National Student Survey), module evaluation questionnaires and meetings with student representatives to improve the quality of programmes. Staff development The quality of teaching is assured through staff review and staff development in learning, teaching and assessment. Internal Review All programmes are reviewed annually and periodically, informed by a range of data and feedback, to ensure quality and standards of programmes and to make improvements to programmes. 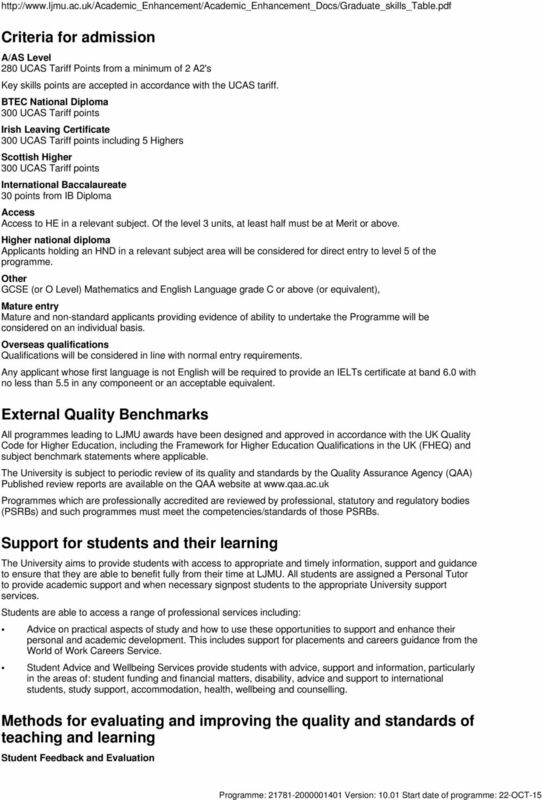 External Examining External examiners are appointed to programmes to assess whether: the University is maintaining the threshold academic standards set for awards in accordance with the FHEQ and applicable subject benchmark statements the assessment process measures student achievement rigorously and fairly against the intended outcomes of the programme(s) and is conducted in line with University policies and regulations the academic standards are comparable with those in other UK higher education institutions of which external examiners have experience the achievement of students are comparable with those in other UK higher education institutions of which the external examiners have experience and to provide informative comment and recommendations on: good practice and innovation relating to learning, teaching and assessment observed by external examiners opportunities to enhance the quality of the learning opportunities provided to students Please note: This specification provides a concise summary of the main features of the programme and the learning outcomes that a typical student might reasonably be expected to achieve and demonstrate if he/she takes full advantage of the learning opportunities that are provided. 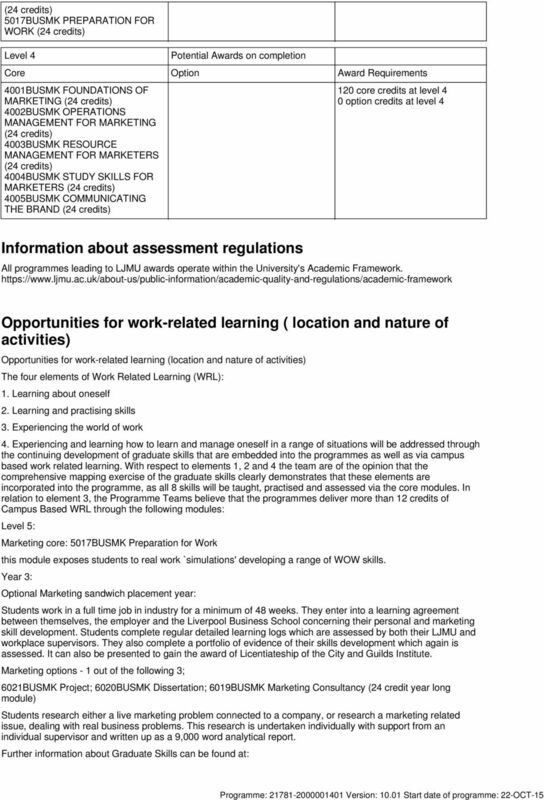 More detailed information on the learning outcomes, content, teaching, learning and assessment methods of each module can be found in module and programme guides. Final Award. (exit route if applicable for Postgraduate Taught Programmes) G604 JACS Code. Length of Programme. Queen s University Belfast.